Last Updated: 16 July 2013. Our school is located in the heart of the temple city. 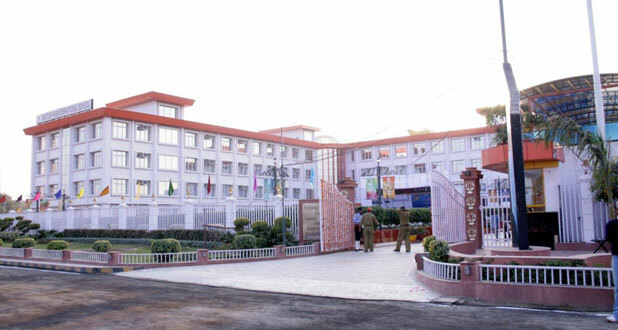 It has a sprawling campus of 15 acres. The famous patriotic poet Subramanya Bharathi worked in our school. Our school is called as Sethupathy Higher Secondary School. It has a large play ground. Our school has 25 class rooms and three laboratories. Class rooms are spacious and airy. Shady trees around the play ground add beauty to our school complex. Forty teachers are working in our school. About 2000 students are studied in our school. Our Headmaster is a strict administrator. His speeches in the assembly inspire all of us. Our school has a big indoor auditorium also. All the school functions are held there only. NCC parade in our school grounds looks really wonderful. The District collector who presides over the school day function expressed his satisfaction over the infrastructure of our school. In the evenings we play football in the school ground till 6 P.M. Our Headmaster has recently built a cycle stand for us. A lunch hall is being built. Separate rooms have been built for library, N.C.C, N.S.S and Scouts. I am really proud to be a student of this school.